UPDATE: To make it work again after Update to the Creators Update of Windows 10 scroll down to the red part of text and disable the specified driver part again. Then restart your viewer. I used my SpaceNavigator a lot in Second Life and was mad about loosing the service of actual drivers. Because in SL the new driver generation 10.x didn’t work I researched every article on the net I could find. Sorry to say every article have some flaws that lead to a NO-success following them. But studying the contents all together let me find the way to let the new drivers work. To make it clear: I’m writing about using the SpaceNavigator in Windows 10 64bit with Firestorm. Other constellations MAY work but I could test it only on my own configuration on 2 PCs with Windows 10, one with Home Edition and one with the Pro Edition used for the Windows Insider Beta testing. Both are German versions of Windows so maybe I dont know the exact wording of English Windows 10 installations. Here I try to do a complete list of what have to be done on Windows 10 to get it working with the actual driver generation 10.x instead of sticking to the outdated and no more updated version 3.x. If you think there is anything wrong with this procedure send me an Email and I will correct and update this page! Disconnect your SpaceNavigator from the PC. First thing is to clean up your Windows from outdated driver parts. Deinstall everything about 3Dconnexion from your PC in the Apps & Features section. This means any version of 3Dconnexion drivers you had tried before. This is normal NOT neccessary if you have already installed an older version of the 10.x drivers. Dont forget to save a copy of the registry before changing something in case you run into trouble by deleting a wrong line. Follow the instructions on Microsoft’s Knowledge Base article Q322756 to create a backup or restore your registry. any entry of 3Dconnexion and SpaceNavigator you can find with search in the registry. Look in the Device Manager if there is any entry about 3Dconnexion. There shouldn’t be no ore after the registry cleaning above. Install the driver 3DxWare 10 for Windows (64-bit) from the 3Dconnexion web site. In my case it was the file 3DxWare64_v10-4-10_r2558.exe. If there is a newer version and I havn’t updated already this page send me an Email and I will test if a newer version works too and update this page. Look into the Device Manager if there is an 3Dconnexion KMJ Emulator. There you need to disable a part of this driver. Change your view in the device manager to Devices by connection. Look for an entry 3Dconnexion KMJ Emulator. Click on the > sign to open it and you should see the driver part HID-compliant game controller. Right click this entry and click Deactivate device. This deactivates the KMJ Emulator can be found by the SL viewer. Close the Device Manager. NOW Connect your SpaceNavigator to your PC. Click on Settings (the red framed icon if you dont understand German) and you see the settings dialog. Then start your preferred viewer. Firestorm, Linden Second Life, whatever. When the viewer is loaded – you dont need to log in – click on the viewer to put the focus to the viewer. Now you should see the name of your viewer in the upper left corner of the dialog. Click on the right button to open the key settings. 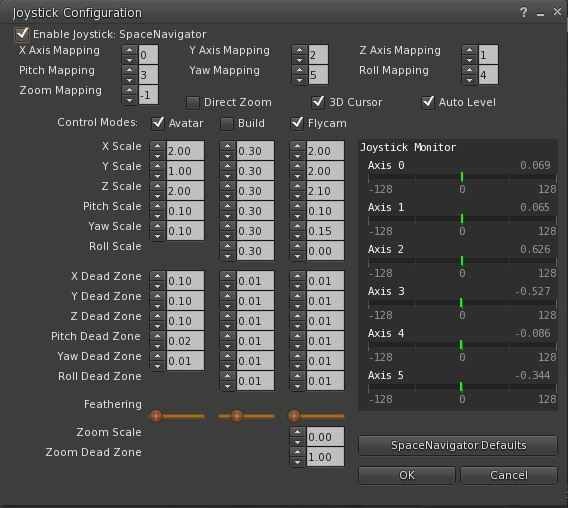 Now you can set one of the both keys of the SpaceNavigator to toggle between the two states for moving your avatar or your cam. Because I’m left handed I set the left key to toggle between the modes.The other key is up to you if you want to assign anything to it. Click on the > sign to the right of the text field and select the field Macros. It opens a new panel where you can scroll down. Scroll down the list and select New Macro. Now we define the keyboard shortcut for Toggle Flight Mode. In the upper field enter the name of the macro for example Toggle Flight Mode. Then click into the lower field to activate macro recording and then press the following keys at once and HOLD THEM: Ctrl-Alt-F. If the result you see in this lower field is anything else about Ctrl-Alt-F then click on the x below the field and restart again with the click on the lower field where the macro recording is shown. C:\Users\[WinLoginID]\AppData\Roaming\3Dconnexion\3DxWare\Cfg\ and the filename depends on your viewer. In case you use Firestorm Release 64bit it should be named FirestormOS-Releasex64.xml. If you use for example a nightly build of Firestorm it has to be named FirestormOS-nightlyx64.xml. Close the viewer. Close the viewer, if it is open and restart the computer. After reboot open your viewer and login. The SpaceNavigator should find your configuration file and set it up properly. But, now you need to setup the viewer. Tick Enable Joystick: SpaceNavigator. Then click OK. Thats it. Because of a bug in the NVIDIA driver 378.49 your wolrd can turn into the blue if you use Firestorm viewer and have switched OFF Advanced Lightning Model. The result isn’t so bad 🙂 I’m feeling like a star in the 3D movie AVATAR. Nevertheless I hope NVIDIA fixes the bug soon. See https://jira.phoenixviewer.com/browse/FIRE-20774 in the Jira bugtracker.